NEW! From the developers of SimplyMap, powerful analytics and data visualization for everyone. SimplyAnalytics is a web-based mapping, analytics, and data visualization application that makes it easy for anyone to create interactive maps, charts, and reports using 100,000+ data variables. Answering questions using premium demographic, business, health, and marketing data has never been easier. Explore SimplyAnalytics today! SimplyAnalytic’s intuitive analysis tools generate detailed custom maps and reports for any location in the country. Add individual data variables or entire groups of variables and generate a report in seconds, or create a ring study report illustrating the characteristics of the 1-, 3-, and 5-mile radius surrounding your target location. Rank locations, apply filters to maps and reports, and create custom study areas to further hone your research. 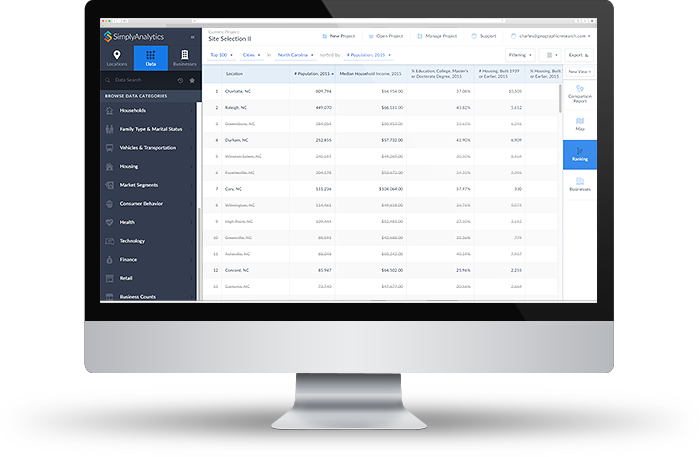 With SimplyAnalytics, the entire user interface was designed with you in mind. Anyone can make maps and reports with just a few clicks, and everything you create can be exported or emailed to any email address. Our interactive wizards walk new users through the process of making maps and reports. In addition, industry-leading customer service, live chat, speedy email support, and numerous tutorial videos make it easy to find the answers you need when you get stuck. 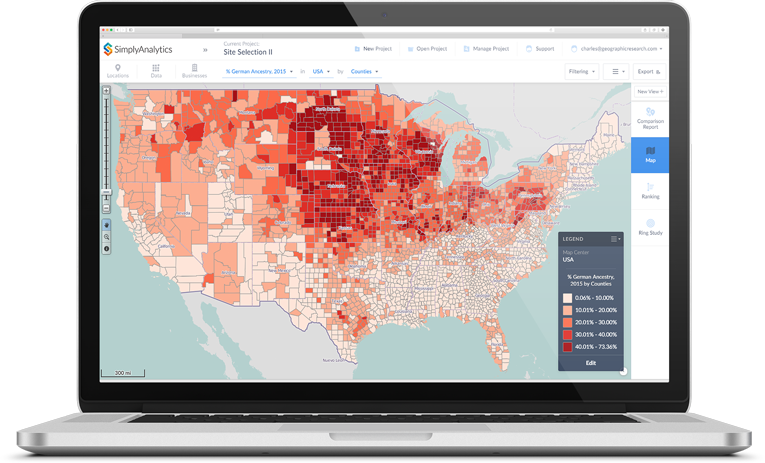 SimplyAnalytics has all the data you need to answer key research questions, make sound business decisions, and understand the socio-demographic and economic conditions of any geographic area in the United States and Canada. We currently offer more than 75,000 data variables related to demographics, employment, housing, market segments, businesses, consumer spending, brand preferences, public health, and more from industry-leading data vendors. Create professional quality maps using 100,000+ data variables. Customize colors, data categories, boundaries, and other features. Create projects to organize your work. SimplyAnalytics generates intuitive and detailed custom reports for any location in the country. Several useful views of your data are auto-generated to answer your questions faster than ever. Add business locations to your map, or create a business report to view details on more than 22 million businesses. Want to know the top 50 wealthiest counties in the USA? Quickly create rankings using any location and data variable. 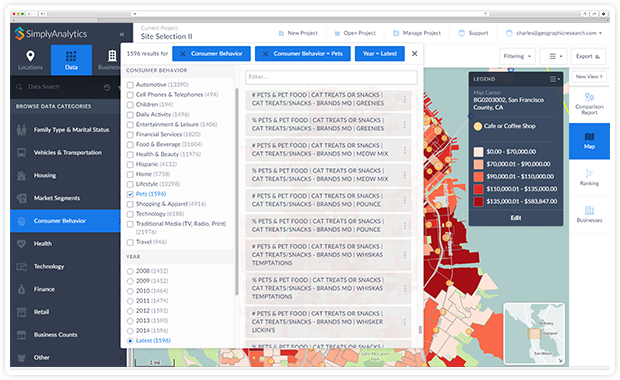 Identify target areas in maps and reports using powerful data filters. Collaborate with other SimplyAnalytics users by sharing your maps and reports.